I am well aware that I feed an army each day. But sometimes, the reality of how much food it actually takes to feed this army leaves me with my mouth hanging open. Take, for instance, the fact that we got 20 pounds of nectarines last week in our Azure Standard order. Within only 5 days, our family had polished off 15 pounds of them. Do you know how many nectarines that is? Neither do I. But it was a lot of nectarines. As the box was emptying, I decided to get a little bit creative. Some of the nectarines were getting pretty soft – a little too soft to slice nicely. Therefore, into the food processor they went, skin and all. (I did remove the pit. I thought I’d mention that for those of you who were considering throwing the entire piece of fruit directly into the machine. Don’t do that.) 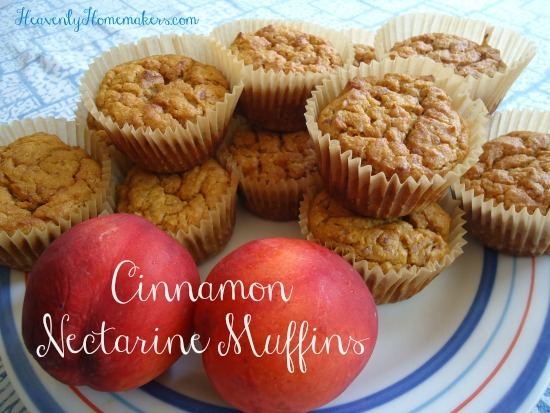 The food processor turned out a very nice nectarine puree, which when stirred into other fine ingredients, turned out a most deliciously moist muffin. In a large bowl, mix together flour, sucanat, baking powder, salt, and cinnamon. Stir in pureed fruit, sour cream, melted butter, vanilla, and egg. Once mixed, scoop batter into well buttered or paper-lined muffin tins. Bake in a 400° oven for 25-30 minutes or until muffins are golden brown. Makes about 15 muffins. I found that these muffins required a little more baking time than a typical muffin. You may want to prick one with a toothpick to make sure it comes out clean so the muffins aren’t doughy. Which do you like best: nectarines or peaches? Peaches, if I can ever find a nice ripe one! Nectarines for me so I was disappointed when they didn’t make the truck on my last Azure Standard order. Peaches did make the truck so I think we’ll try this recipe using peaches!! Love that it calls for only 1/4 cup sucanat!! These look healthy and delicious! I used to prefer nectarines as they don’t have the fuzz, but I eat more peaches so they are becoming my favorite. Thanks for the recipe. I personally haven’t had very many bad nectarines. Even in the winter months. Peaches for me are harder to get good ones unless I go to a peach farm. I vote for peaches. Especially the perfectly, drip down your chin, ripe ones from the orchard I grew up going to in Virginia. This recipe sounds delicious! Nectarines! I have a thing about eating fuzzy fruit ;) And to peel every peach we would want to eat might drive me crazy. Easier to just buy nectarines. Peaches! Living on the edge though and trying this with plums….because that is what I have. I’m starting to have that whole mouth-hanging-open-at-the-amount-of-food-consumed thing and my kiddos are 6,4 and 18 mos. I’m really in trouble in about a decade! I am definitely a peach lover. We had a very nice crop this year and I have quite a few put away in the freezer. Do you think this would work with frozen peaches?